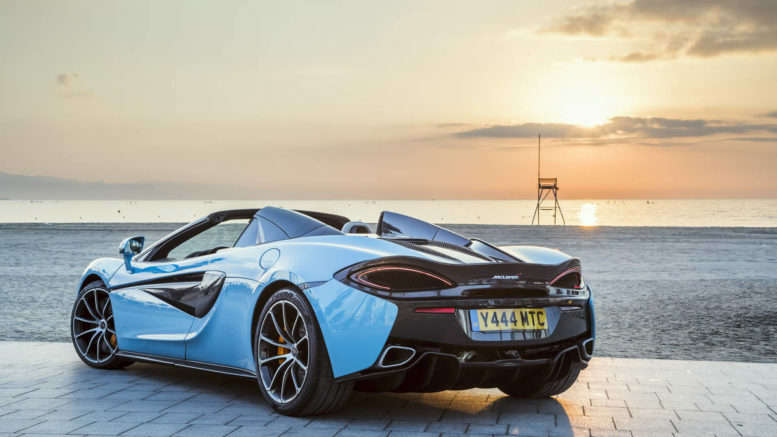 The McLaren 570S Spider is one of the most versatile sports cars around. It’s fast, comfortable and practical, but it’s slightly less capable from the factory than its fixed-roof brethren. McLaren is changing that with a new lightweight track pack. It’s similar to the one on the 570S Coupe and shaves nearly 73 pounds from the car. That said, at more than $24,000, it’s not exactly the cheapest way to go on a diet. According to McLaren, 10 percent of 570S coupe owners opt for the track pack. Carbon fiber is the name of the game here. Inside, Alcantara-wrapped carbon-fiber seats shave 29 pounds from the car. These are paired with a Alcantara steering wheel with carbon-fiber spokes and shift paddles. The doors, center console, and infotainment system all have carbon-fiber trim, too. All track pack models are fitted with McLaren’s Track Telemetry system. On the outside, the 570S Spider track pack gets a Dark Palladium-painted roof and lightweight 10-spoke forged alloy wheels with Pirelli P-Zero Corsa summer tires. Those wheels save 33 pounds in total. Customers can option some carbon-fiber trim pieces, too. The 3.8-liter twin-turbocharged V8 breathes a little easier thanks to a new titanium exhaust system. McLaren doesn’t say how much power it adds, but it should at least make the car a little louder.